I'll probably do posts on these various ingredients some time in the future, as they each deserve their own story. While this drink had potential, the smokey flavors were still too dominant and the drink was rather dry. Adding honey syrup helped a bit, so I think the drink could be turned into something rather tasty with a bit more work. I was much more pleased with this one. The ED3 has something of a savory character, which played well with the rhubarb liqueur. The grapefruit juice also kept the sourness of the lime from dominating. Another one that I can see making again. Stir with ice for 30 seconds then strain into a chilled glass. Due this drink being almost pure alcohol (the tinctures are ~190 proof), I chose to stir this one a bit longer than normal. The results were fairly good and it had a wonderful opalescent pink hue. Not exactly my cup of tea, but others enjoyed it and the aquavit managed to play a role without taking over the drink. The tinctures also added both color and smell without being too assertive. This one is in a similar mold to the first cocktail, though I was aiming for a way to utilize the spiciness of the Cruzan and schnapps with the nutty flavor of the amaretto rather than savory bitterness. Almost everyone agreed that it reminded them of Christmas. Perhaps a good one for celebrating the holidays in warmer climes. I also whipped up a margarita and a Fernandito Cocktail with mango puree that ended going down well. For some reason the mango seemed to be introducing grassy notes to those drinks, but that fit well with both. This worked out just as well as I hoped it would. The chocolate and spice flavors from the rum work perfectly with the nut flavor of the amaretto while the honey syrup and orgeat smooth everything out. Another drink that I'll be making again. Overall, it was a good night for me. I was a bit exhausted by the end, but it felt really good to be able to come up with new drinks on the fly. There's always more to learn, but it means that I have a decent grasp on how different flavors will work with each other and can combine them in a pleasing fashion. Just to really cap everything off, I had incredibly gracious guests who left me with a lot of the new liquor I had been using over the course of the night. I'm now ahead a bottle Single Malt Whiskey, a bottle of Krogstad aquavit, a bit of rhubarb liqueur, some Don Eduardo tequila and some homemade tonic syrup. I'm looking forward to making new drinks with all of these ingredients and hopefully sharing some of them with friends as well. Especially with summer coming, I foresee many more cocktail parties in my future. I will admit to having a bit of an ulterior motive here. Over at one of my favorite drinks blogs, RumDood is having a contest to write about our favorite rum experiences. And I can't do better than to describe my entry into the world of rum. I arrived here by something of a circuitous route. For many years I avoided rum after a less than thrilling experience at a rum tasting class held at my alma mater. While I don't remember exactly what was served, I'm pretty sure they were decent aged rums. 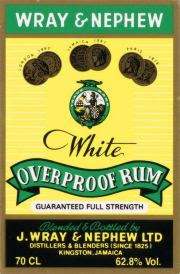 But straight spirits have almost never done much for me and the unfamiliar flavors left me swearing off rum entirely. However, after discovering a love for cachaça, I found myself willing to give rum another chance. While there are distinct differences between cachaça and rum, they both come from sugarcane bases. To help the process along, I serendipitously read about a new-ish rum on the market, Oronoco, which is produced primarily from fresh sugarcane, much like cachaça. To put a twist on that basic formula, it is also blended with a touch of aged Venezuelan rum. This sounded like an excellent compromise. After picking up a bottle, I found that it has hints of the vegetal notes usually found in cachaça, but they are subdued by the aged rum. There are also very strong vanilla presence and a fair bit of molasses sweetness as well. 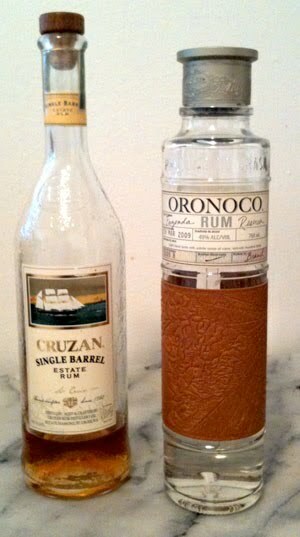 While vanilla is a fairly common flavor element in rums, I find that Oronoco reminds me strongly of baked goods. This is in contrast to other rums such as El Dorado's 3-year aged white rum, which has a much more savory vanilla character. So while Oronoco can make for a mean daiquiri, these days I find that I prefer to place it in a supporting rather than a leading role as the vanilla can become a bit overwhelming. Now that I had come around to the idea of rum a bit, I plunged all the way in and went for an aged rum. Again, primarily on the basis of good reviews, I decided to buy a bottle of Cruzan Estate Single Barrel rum. This really is a different beast. The ESB is a blend of rums aged from 4 to 12 years (the single barrel nomenclature refers to a large mixing vat in which the blend is married for another year or so) and has fairly strong oak notes. So much that when I got my roommate to try some her first response was that it smelled like whiskey. While my first impression was of an overwhelming woody smell, revisiting the ESB has revealed that the oak comes along with a gob of spices and a hint of alcohol and vanilla. The taste is much spicier, overwhelming some of the more delicate flavors in the nose. The more aggressive wood and spice flavors took some work to properly enjoy, but under the right circumstances it can really hit the spot. Muddle ginger, lemon and lime pieces with simple syrup. Add rums and bitters, shake with ice and double strain into a chilled glass. The sourness of the lemon and lime, the bite of the ginger and the flavors of the various rums all play well with each other. The ESB works with the Oronoco, reinforcing the aged rum element. The Oronoco and cachaça bring out each others grassier notes, with all three bringing sugarcane and molasses along. Quite an enjoyable little drink. Next time, the adventures of making my own cocktail ingredients. Since the first time I cracked the bottle, I've been a little bit terrified of the J. Wray. While I've read paeans to it's incredible versatility, even once diluted into a cocktail, there's something about it that smells off to me. The taste is just fine, even kind of interesting, but there's something tickling my nose unpleasantly that I can't quite put a name to. Some days I think it's a bit like off dairy products (how's that for an appealing description), but other times I think it might just be the liquorice and grass notes that other people have found. Either way, I'm now determined to forge ahead and find ways to integrate this unique rum into cocktails. I will not be deterred! On a more pleasant note, I was flipping through Gary Regan's The Joy of Mixology looking for rum drinks when I stumbled upon the Fernandito Cocktail. It calls for a healthy slug of spiced rum and seeing as I filtered a batch of homemade chocolate spiced rum earlier this week (I'll post a recipe for this spiced rum soon), it seemed like a good one to try. While I didn't want to use the full 2 oz. the recipe calls for, a little bit of substitution and a drop in the amount of liqueur resulted in a rather pleasing drink. While I think I shook this cocktail a bit too long, resulting in a too-dilute drink, the overall flavor was still pretty good. The chocolate and spices from the spiced rum played well with the vanilla of the ED3 and berry sweetness of the liqueur with the V/X providing a nice base for it all. Once I've made more spiced rum, I might try this with a 1:1 ratio between the V/X and spiced rums, but this less potent mixture was still a pleasure. Definitely a drink that I will be making again. One of my first real adventures in spirits last year involved the discovery of cachaça. For those of you who haven't heard of cachaça before, it's a sugarcane-based liquor made in Brazil. In contrast to rum (with the exception of rhum agricole, but that's another matter), which is made from molasses, cachaça is made from fresh sugarcane juice that is then fermented and distilled. There are also Brazilian laws regulating factors such as the ABV that cachaça is distilled at and bottled. These factors all contribute to the unique flavor profile of cachaça. I don't remember exactly how I stumbled upon the first article I read about cachaça, but for some reason I was instantly intrigued. After a bit of searching, I ended up a Cachaçagora, a blog dedicated to all things cachaça. My interest stoked, I end up getting a bottle of Boca Loca cachaça for a little over $20. Not half bad for what amounted to an impulse purchase. The place to start with cachaça is the caipirinha, the national drink of Brazil*. While it took a few false starts to perfect the technique (the trick is to cut off the ends of the lime and the central pith), my first proper caipirinha was nothing short of an epiphany. My first thought was "I want to sit on the beach and drink these forever". The sugarcane and vegetal notes of the cachaça are balanced by the sour flavor of the lime and smoothed by the sugar. Sadly I had to get up early the next morning, so moderation was exercised, but they are one of the truly perfect drinks that I've ever enjoyed. In the meantime, here's a caipirinha variation I made last night. It needs a little tweaking, but I was rather pleased with the results given that I had semi-randomly thrown things together. Muddle lime wedges and cranberries with simple syrup. Add cachaça and bitters, shake with ice and double strain into a chilled glass. *The Brazilian government has gone so far as to codify the recipe for the caipirinha into law. My interest in cocktails has been growing over the last year or so and it seemed like a good time to start sharing some of what I've been learning. While I've enjoyed a good cocktail for some years, it's only been in the last year or so that I've delved very deeply into the bourgeoning cocktail culture. I should first thank the wonderful people at House Spirits for this renewed interest. My local alumni association was kind enough to schedule a tour of local distilleries last September and our first stop was at House Distilleries. After the usual tour of their facilities and the tasting room, we sat down to try cocktails made with their main spirits. Christian Krogstad, one of the founders, was mixing the drinks and did a fantastic job of explaining how each of the spirits worked with the other (often fresh) ingredients. It was a revelation, as I'd previously only thrown together rather hack-job cocktails before. I left with my mind buzzing (in more ways than one) and was almost instantly hooked. As I have long held a strong affection for House Spirit's Aviation Gin, that quickly became the focus of my cocktail experimentation. Many of the experiments had their basis in the Bee's Knees and the Bridgeport Bramble from Jeffery Morganthaler's blog, another source of inspiration. Many of the variations included homemade ginger syrup, which can often add a delightful kick to these cocktails. Soon my interests turned to other spirits, but that's a story for another time.